Point Lenana is Mt. 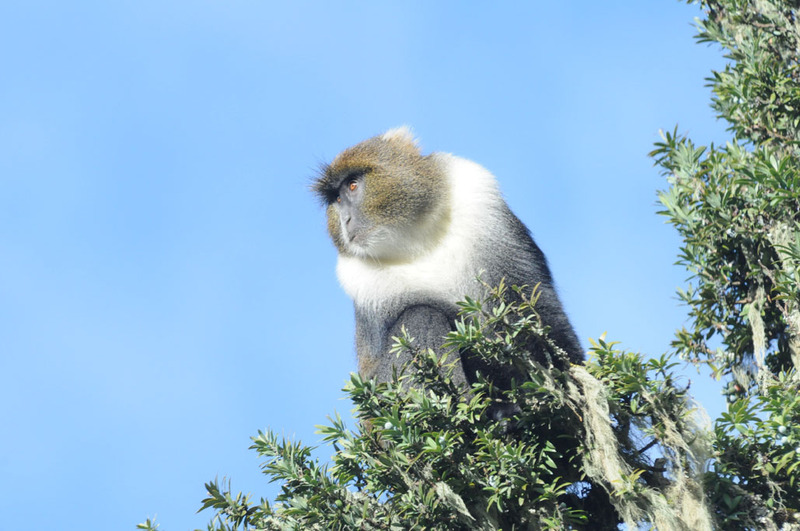 Kenya’s trekking summit and offers a chance to see a part of the East African wild lands traveled on by only a fraction of the number of people who visit Kilimanjaro. Batian is the mountaineering summit, which was first climbed by the legendary adventurers Eric Shipton and Percy Wyn Harris in 1929 of what we now call the Normal Route. Today it is a 20-pitch rock climb rated at 5.5. 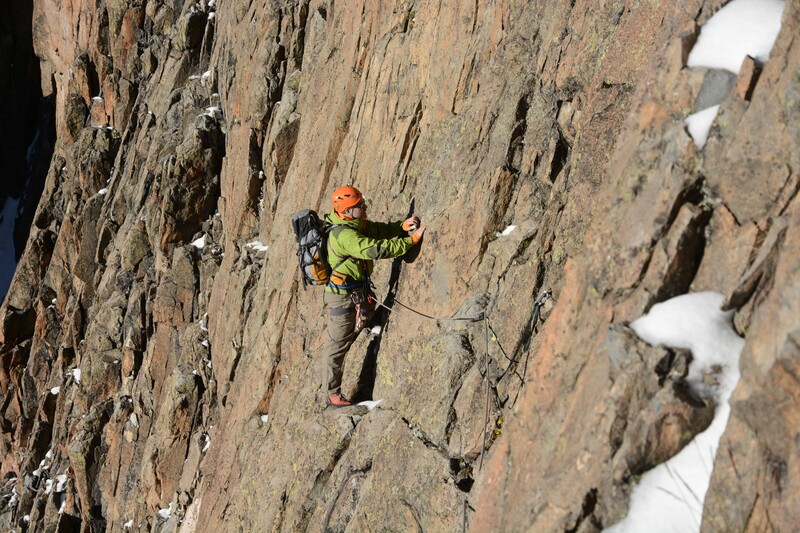 This climb offers a unique and remote high altitude alpine rock climb that is attempted by only a handful of people each year. 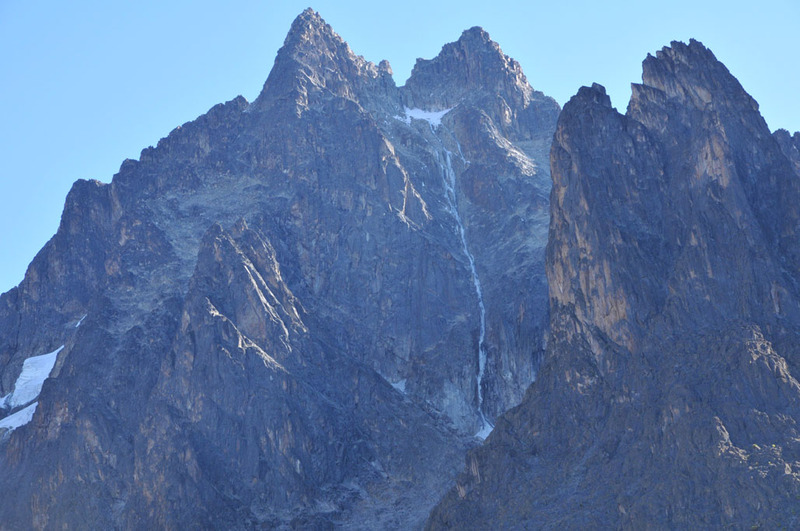 Day 1: Naro Moro Gate (2400m/7874’) to Naro Moro River Camp (3049m/10,003’). Team members fly to Nairobi, Kenya. After getting organized we are driven to Mt. Kenya National Park. We enter the park through the Naro Moro Gate. An afternoon walk through the jungle on a well maintained dirt road brings us to our first camp where we stay in huts. This hike usually takes 3-4 hours. Meals included: Breakfast and Dinners included every day. 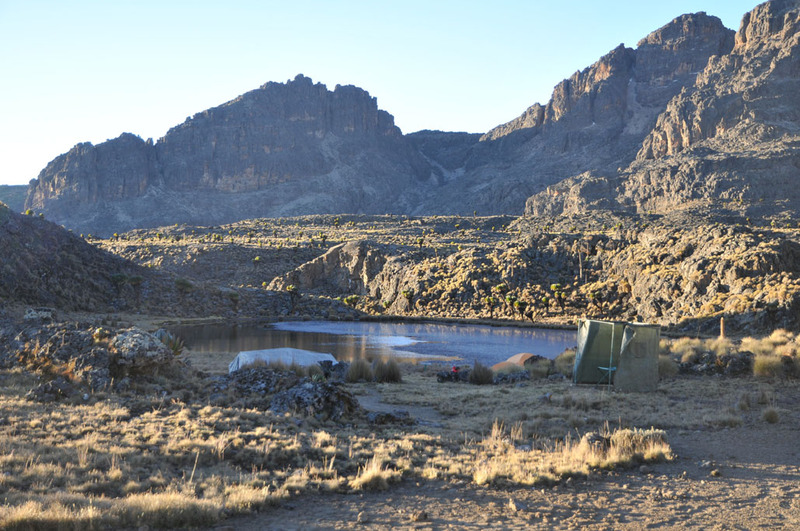 Day 2: Naro Moro River Camp to MacKinder’s Camp (4200m/13,799’). Our route today brings us out of the jungle to more open terrain. 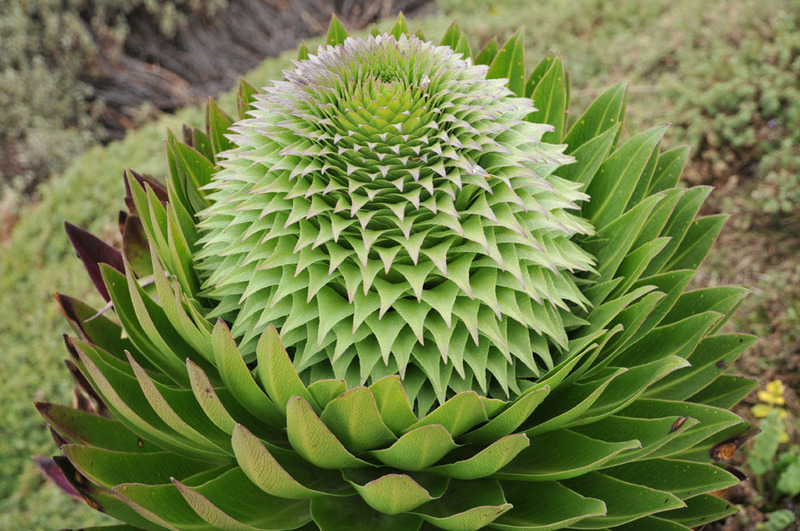 The vegetation changes and a couple forms of the local lobelia plants are prevalent. There is also a good chance of seeing rock hyrax’s that dwell near tonight’s camp. The hyrax is the only living relative to elephants. As we near camp we also begin seeing views of Mt. 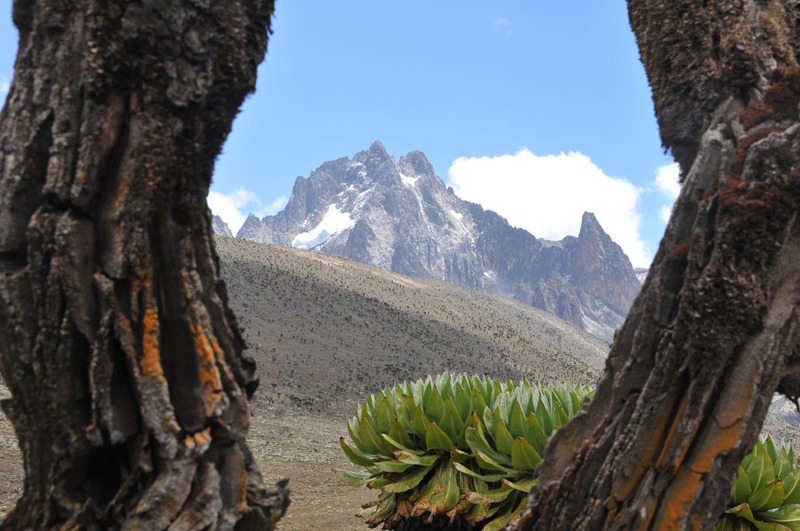 Kenya’s twin summits Nelion and Batian. Today’s hike usually takes between 5-8 hours. Day 3: MacKinder’s Camp (4200m/13,799’) to the Austrian Hut (4790m/15,715’). Today we ascend above the vegetation zone into an alpine environment. The Austrian Hut is the perfect staging ground for climbs on the south side of Mt. 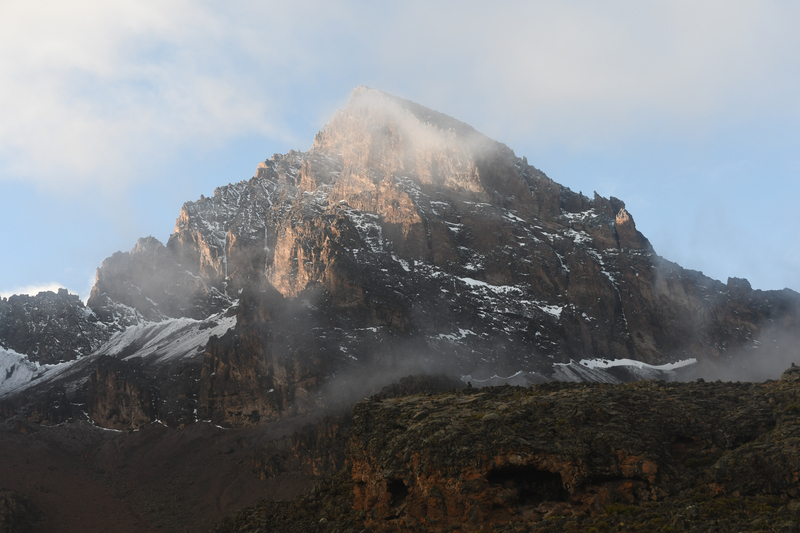 Kenya and for reaching the trekking summit Point Lenana. Glaciers and high alpine lakes reveal themselves as we climb to this hut. This hike usually takes 4-6 hours. Upon arrival we will settle into the hut and begin preparations for climbing. 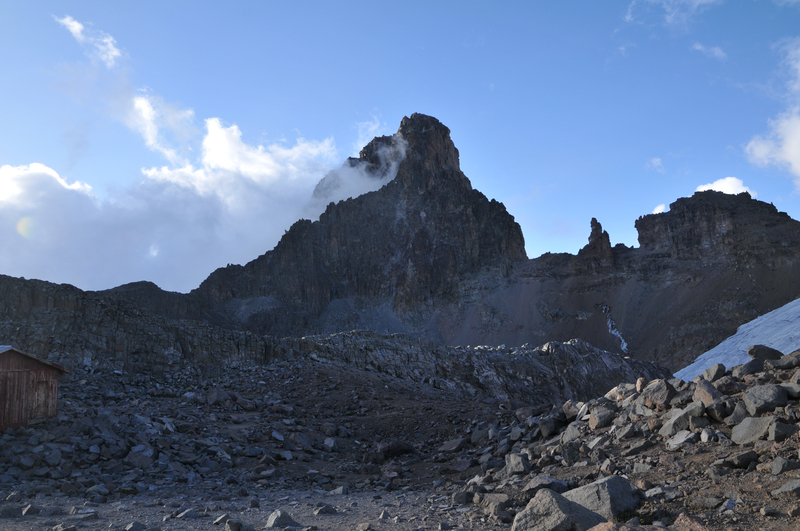 Day 4: Austrian Hut (4790m/15,715’) to Point Lenana (4984m/16,350’). The climb to Point Lenana is a short one from the Austrian Hut. The views are spectacular. 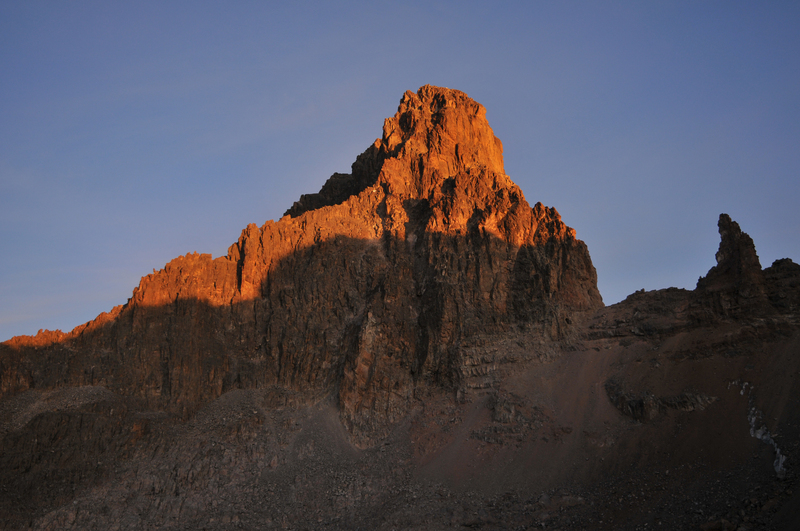 Most people prefer to climb in the early morning arriving at the summit shortly after sunrise. This offers a truly memorable view of the South Face of Mt. 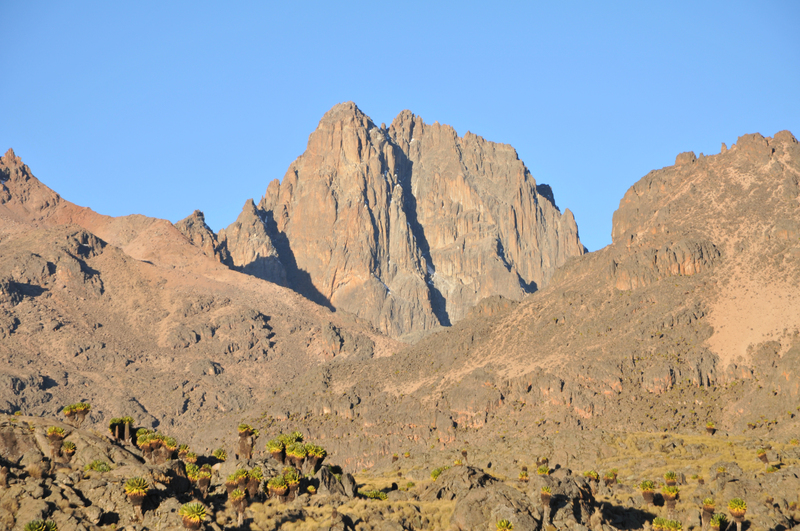 Kenya, Nelion, and Batian in the morning light. The views from this remote spot are truly inspiring in all 360 degrees. 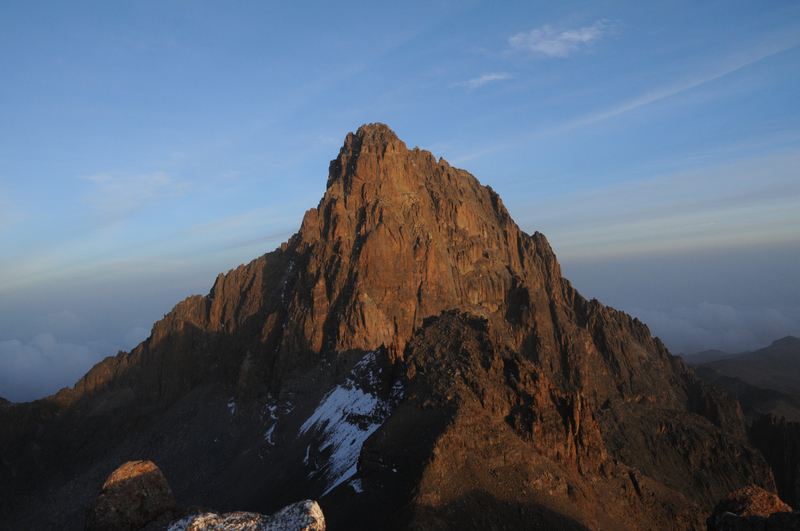 For the trekkers in the group this is the highest point you reach during your visit to Mt. Kenya National Park. For those planning to rock climb to either of Mt. 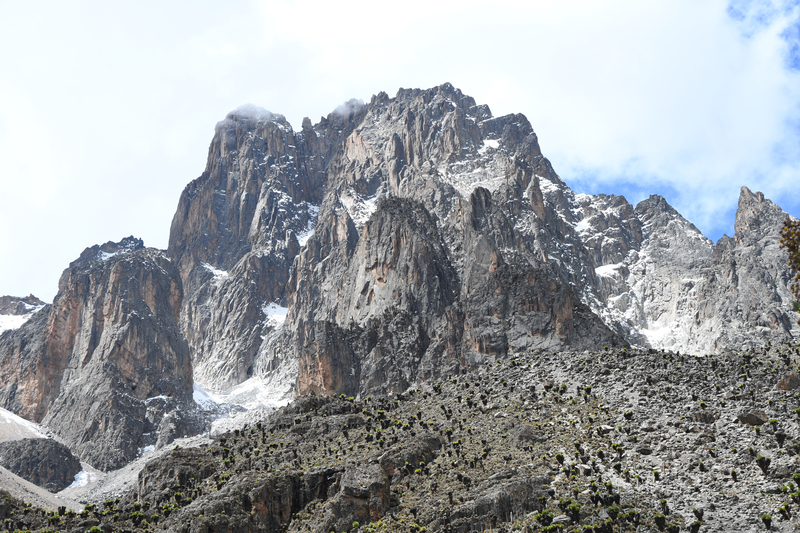 Kenya’s two technical summits a hike to Point Lenana serves as an excellent acclimatization day. Day 5: Austrian Hut to the start of the South Face. Our goal is to ferry our climbing gear to the base of the route. From the Austrian Hut we descend to the lateral moraine of the glacier separating us from the South Face. After donning crampons we cross the glacier then climb through boulder fields and talus to the start of our route. The trip takes a couple hours. This day offers us the opportunity to scope out our approach for summit day in addition to leaving our gear at the base of the route. Day 6: Summit Day via the South Face. A pre dawn wake up call is followed by breakfast. We then navigate by headlamp to the glacier. Crossing the glacier we then make our way to the base of the route. We rope up here and start our ascent. 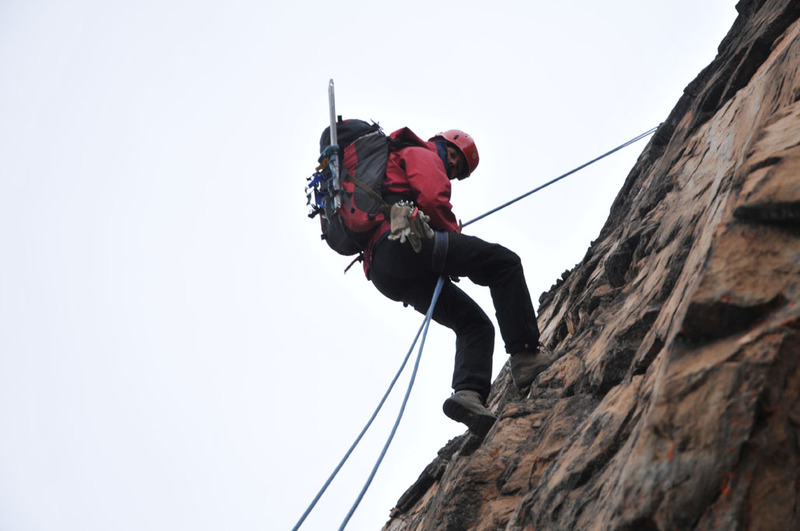 The climbing varies between 3rd and 4th class terrain to pitches of mid 5th class. The route stays reasonable and the route finding is exciting over approximately 20 pitches of climbing. 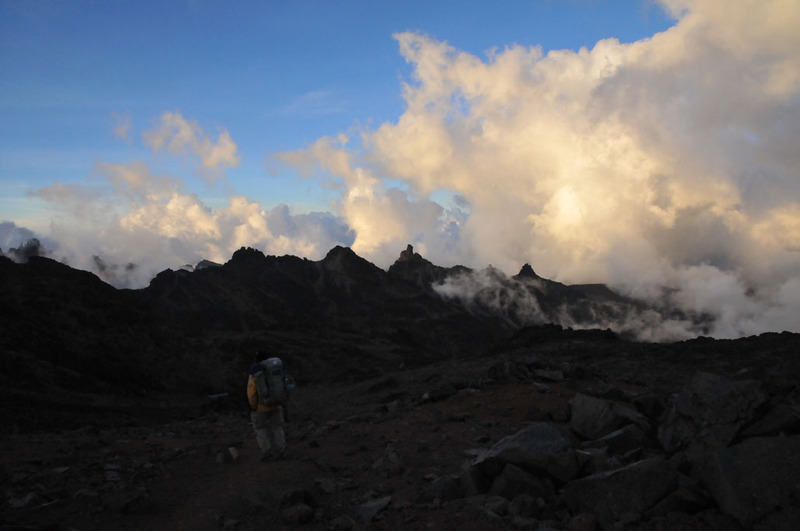 The first summit that is reached is Nelion. The Howell Hut is here, which is a small well kept up shelter that sleeps four. For those wishing to continue to Batian the route descends into a notch known as the Gate of the Mist. The descent is followed by a few more pitches of climbing to reach the summit of Batian (5199m/17,058’). The descent retraces our steps back to Nelion then a series of rappels bring us eventually back to the base of the climb. Day 7: Extra day built in for weather and/or acclimatization. Day 8: Austrian Hut (4790m/15,715’) to Old Moses Camp (3330m/10,925’). It takes 1 ½ days to exit Mt. Kenya National Park via the Sirimon Park Gate. Another side of the mountain is seen as we descend across open fields arriving just above the jungle zone. The walk takes 7-9 hours. Day 9: Old Moses Camp (3330m/10,925’) to the Sirimon Park Gate (2650m/8694’). This morning’s hike brings us back into the jungle environment. Along the way we pass by the equator. It is possible to see wild animals including elephants, zebras, cape buffalo, and more. We arrive at the park gate where transportation greets us for the return trip to Nairobi. Day 10: Fly home or continue on to Kilimanjaro.